The suit seeks to establish that Kaporos violates California Penal Code 597(a) which prohibits “maliciously and intentionally” killing an animal. Some of the laws that are blatantly not enforced include animal nuisance laws which prohibit sellers of live poultry from leaving chicken blood, feces and feathers on the sidewalk and street. It is illegal to pile up dead animals on the street prior to their disposal. Photos exist of thousands of dead chickens awaiting disposal in trash trucks in major U.S. cities, including Los Angeles and New York. The chickens need mercy from us. We ask Kaporos observers to show mercy and use money instead of chickens. 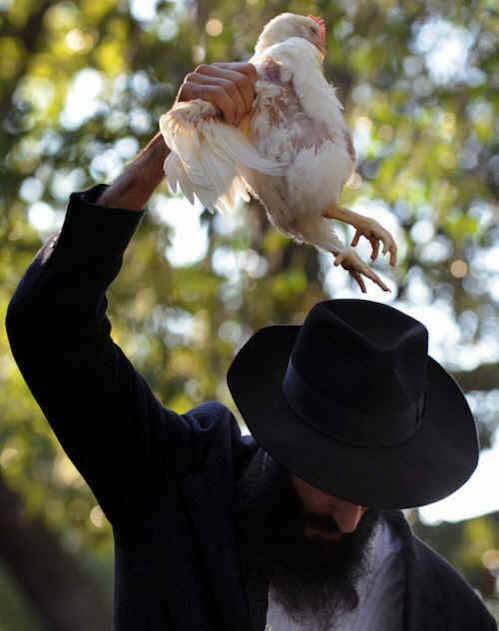 Orange County, CA – October 3, 2016 – United Poultry Concerns is the plaintiff in a federal Kaporos lawsuit filed by San Diego attorneys Bryan W. Pease and David R. Simon on September 29, 2016 against Chabad of Irvine, Orange County, CA. The suit seeks to establish that Kaporos violates California Penal Code 597(a) which prohibits “maliciously and intentionally” killing an animal. It also seeks a temporary restraining order prior to October 10, 2016 to prohibit the ritual from being conducted this year by Chabad of Irvine, which, if granted, could be used to convince authorities in other jurisdictions to enforce the law. "For more than 20 years, law enforcement agencies in the U.S. have mistakenly believed they cannot enforce basic animal cruelty laws against the religious sacrifice of animals. Nothing could be further from the truth. While states and local government are constitutionally prohibited from specifically targeting religion, laws that apply to everybody apply equally to those motivated by religion.” Pease added, "The California legislature knows how to create an exception for religion, as it has done for Kosher and Halal slaughter. However, there is no exception in the California Penal Code for intentionally killing an animal not for food and disposing of that animal, based on religious belief." Read the lawsuit here.